We may amend this notice from time to time to keep it up to date with legal requirements and the way we operate our business. Please regularly check these pages for the latest version of this notice. If we make significant changes to this privacy notice, we will seek to inform you by notice on our website or email (“Notice of Change“). You have a right to contact us at privacy.fc-lm@lmco.com for more information about the safeguards we have put in place (including a copy of relevant contractual commitments) to ensure the adequate protection of your personal data when this is transferred as mentioned above. We have implemented and maintain appropriate technical and organisational security measures, policies and procedures designed to reduce the risk of accidental destruction or loss, or the unauthorised disclosure or access to such information appropriate to the nature of the information concerned. As the security of information depends in part on the security of the computer you use to communicate with us and the security you use to protect User IDs and passwords please take appropriate measures to protect this information. We may ask you for additional information to confirm your identity and for security purposes, before disclosing the personal data requested to you. In some instances, we may not be able to fully address your request; for example, if your request for access to Personal Data affects Lockheed Martin’s duty of confidentiality owed to others or if your request is to erase Personal Data that is still required to fulfil a contractual obligation. In other instances, we may be legally entitled to deal with your request in a different manner. Furthermore, we reserve the right to charge a fee where permitted by law, for instance if your request is manifestly unfounded or excessive. You can exercise your rights by contacting us at privacy.fc-lm@lmco.com. Subject to legal and other permissible considerations, we will make every reasonable effort to honour your request promptly or inform you if we require further information in order to fulfil your request. to comply with a legal obligation to which Lockheed Martin Corporation is subject. If you have any questions, concerns or complaints regarding our compliance with this notice and the data protection laws, or if you wish to exercise your rights, we encourage you to first contact us at Data Protection Contact, Lockheed Martin UK, Fusion 1, 1000 Parkway, Solent Business Park, Whiteley, PO15 7AA, Chief Privacy Officer, Lockheed Martin Corporation, 6801 Rockledge Drive, Bethesda, Maryland 20817, or privacy.fc-lm@lmco.com. 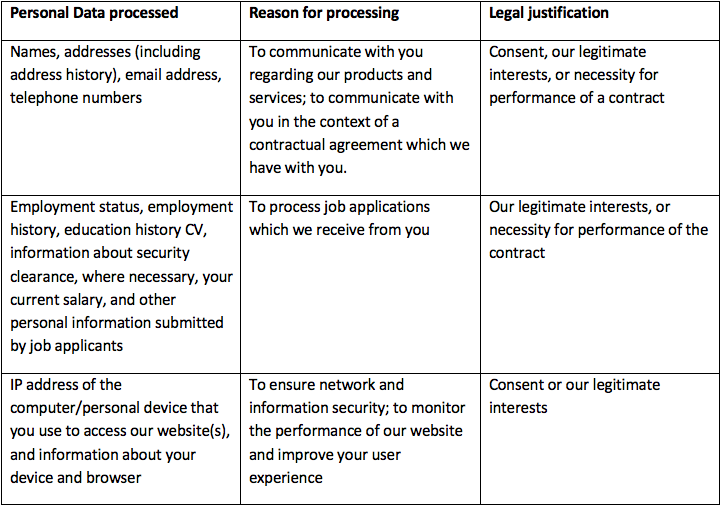 We will investigate and attempt to resolve complaints and disputes and will make every reasonable effort to honour your wish to exercise your rights as quickly as possible and in any event, within the timeframes provided by data protection laws.